Professional-Quality Condenser Capsule. Although smaller in frame than its predecessor, the Stereo VideoMic Pro is equipped with a matched pair of high-sensitivity half-inch cardioid condenser capsules in a coincident XY pair, providing a wide stereo field with natural depth. The cardioid pickup pattern allows optimal atmospheric audio capture. High-Pass Filter. A 2-step high pass filter with 0 and 75 Hz settings allows you reduce the effects of low-frequency hum, camera motor noise, and other external interference. Power Supply. The VideoMic Pro is rated for 100 hours of use on a single 9 V battery (not included). The 3.5mm mini plug is compatible with a wide variety of different cameras and audio devices. Additional Features. 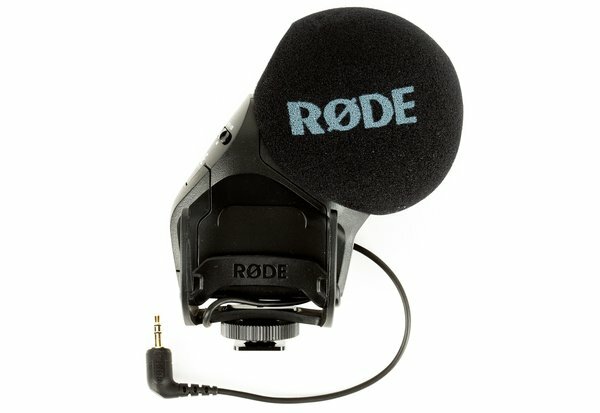 The microphone is equipped with a shock mount and windscreen to further minimize the pickup of undesired audio, and has a standard camera shoe and a 3/8" threaded mount for easy attachment to cameras and boom poles.